Dreamers and Dissidents — Watershed Productions Inc. The series was broadcast on Knowledge Network TV and their website on August 3rd, 2015. See the Knowledge Network’s website to view Dreamers and Dissidents. 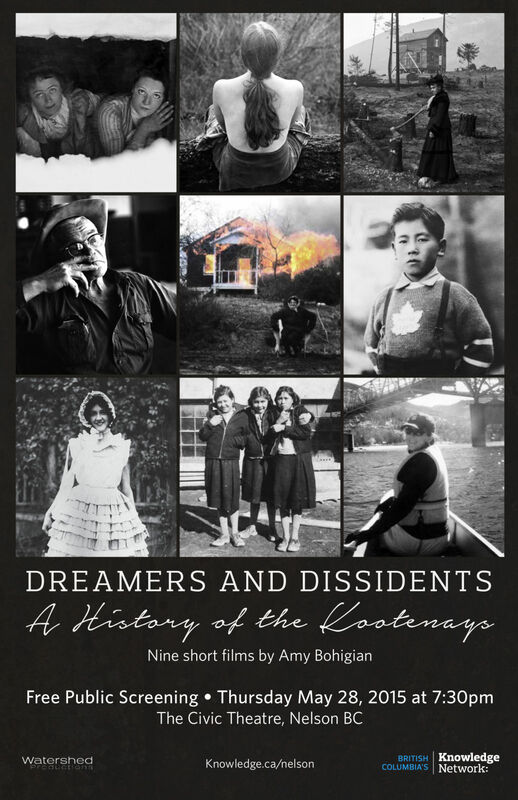 Dreamers and Dissidents is a series of personal stories told by nine individuals who have all moved and lived in the Kootenays over the generations. From war resisters to residential school survivors, hopeful immigrants to pioneering women, Dreamers and Dissidents explores why certain people are drawn to BC’s rugged interior. Through family albums, archival photos and intimate interviews, we learn how Nelson – and the broader Kootenay region – came to be known for its resilient spirit. A pioneering woman sets off on foot from the coast for adventure with her family and her camera in 1898, documenting rugged interior life along the way, as she earns a reputation cooking at mining and logging camps. This story weaves together the stories of three women of different generations who have all fled persecution for their anti-establishment beliefs and protestations of war. Each woman learned to live communally ‘off the land’ while finding tolerance and a strong sense of community in the Kootenays. Basil Izumi was five years old when his family was torn apart and sent to live at the internment camps in the Kootenays at the beginning of World War Two. His father, who was a professional photographer, made an album of his childhood that became a precious gift to his son. Stanley Triggs travelled to the Easy Kootenays from 1967-1972, the years that the prime agricultural land was being transformed by the building of major Hydro dams in the region. He documented the farmers, the landscape and a way of life that disappeared after the land was flooded. Gina Landucci tells us the story of her Italian grandfather who moved to Trail in the early 1900’s to work at the local mine and smelting company. Soon after, Gina’s mother, Felecita, came over as many Italians settled in the region, recreating their culture in the grocery stores, bocci pit and social clubs. Jack and Daisy Philips were lured from England to Windermere in the early 1900’s by the promise of prime agricultural land made by the promotional campaigns of Robert Randolph Bruce. After a couple hard years and a failed settlement they abandoned their farm to fight in World War One leaving behind the farm and their hopes for a new life. Sophie Pierre was forced to attend St. Eugene’s Residential School as a girl in the early 1960’s, removing her from her family and aboriginal culture. After her departure from the school she went on to become a prominent leader among the Ktunaxa and First Nations people, bringing about a transformation to the old residential school and the people whom the school had impacted. Bruce Rohn was a teenager when he and his family were forced out of his childhood home by Hydro BC to clear the land for the dams in the late 1960’s, displacing over 2000 people. Bruce worked on the crews, clearing land and burning houses. Amy Bohigian and her partner, Jane Byers, were on their honeymoon in the Nelson in 2005 when they were inspired to leave the fast paced city for a new life in the Kootenays. Amy was pulled by the natural beauty, but it was the strong sense of community that has anchored her and her family here for the long-term.